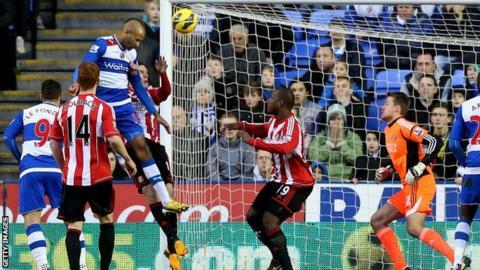 Two goals from Jimmy Kebe helped Reading beat Sunderland as the Royals moved two points clear of the Premier League relegation zone. The Mali forward rifled in an early opener as the hosts dominated against a Black Cats side aiming to move into the top half of the table. Sunderland equalised through a Craig Gardner penalty after Pavel Pogrebnyak clumsily fouled John O'Shea. "Reading have done it again. Another day, another win. They're coming thick and fast for Brian McDermott and his side now as Jimmy Kebe scored two goals to see off Sunderland." But Kebe towered above Gardner to meet Ian Harte's free-kick in a late twist. Sunderland's new £5m striker Danny Graham forced home goalkeeper Adam Federici into a brilliant acrobatic save just seconds before Reading's winner. But instead, Kebe was the match-winner as Reading again showed their fighting qualities to clinch their third victory in four league matches. Reading's impressive recent form has been characterised by a steely resilience which has enabled them to cancel out deficits in each of the last four top-flight games. Before kick-off, Brian McDermott insisted he did not want his team to make a habit of going behind before a late rally - and they responded by taking an early lead in a dominant opening. Eight of Reading's last nine Premier League goals have been scored in the last 20 minutes. Six have been netted in the 82nd minute or later. Sunderland allowed Royals skipper Jobi McAnuff far too much space in the left channel of their penalty area and he picked out Kebe, who took a superb first touch which gave him space to rifle past Simon Mignolet. However, it looked as though Reading would have to be content with just a point. Sunderland had little possession in the first half-hour, but they were given a golden opportunity to gain a foothold in the match following Pogrebnyak's rash sliding challenge on visiting skipper O'Shea. Referee Lee Mason pointed to the spot and Gardner smashed a venomous spot-kick out of Federici's reach into the bottom left corner. Both teams lacked punch in a scrappy start to the second half and Royals boss McDermott reacted by introducing in-form striker Adam Le Fondre and new signing Nick Blackman. Le Fondre had scored seven goals in his five previous matches, including a late brace which salvaged a point in a 2-2 draw against Chelsea on Wednesday, but it was still not enough to promote him into the Royals' starting XI. Sunderland counterpart Graham also had to be content with a place on the bench following his move from Swansea. And he almost made an instant impact after being introduced by Martin O'Neill with 10 minutes remaining. A huge roar from the travelling Sunderland fans greeted Graham, a boyhood Newcastle supporter who once made disparaging comments about the Wearside club, and he was denied twice in quick succession. Reading have accumulated 18 of their 23 points this season at Madejski Stadium. He rose to meet Adam Johnson's right-wing cross with a far-post header, only to be denied by a block by Reading defender Alex Pearce, before Federici made another brilliant save from the subsequent corner. Sunderland had not been beaten in their previous three league matches but Kebe pounced to keep the Black Cats out of the top 10, while Reading remain 17th but are two points clear of the relegation zone. "It was a tough game. I thought we started well and scored the early goal before conceding the penalty. "We have talked in the dressing room about Jimmy Kebe's prowess in the air, which he thought was greatly amusing. But no-one's laughing today - it was a great finish and a great ball by Ian Harte. "We're absolutely delighted to get the three points." "My main emotion is one of disappointment. Conceding a goal so late in the match, coming off the back of a couple of decent chances, is frustrating. But we have to take it and look forward to the next match. "Reading adapted to the conditions better than we did and the pitch was firm and slippery on top. They started more brightly than we did and got the goal which they deserved. "We got back in through the penalty and from then on we were never out of the game. It could have gone either way, but to concede was very disappointing."